Surface acoustic wave devices find a wide range of application in the healthcare and medicine industry. Surface acoustic wave devices are widely used for monitoring strain and pressure. Furthermore, surface acoustic wave devices are used for taking measurement of pressure fluctuation in different industrial applications. Rise in demand for small sensors in the field of healthcare and medicine due to low cost and reliability are some of the factors which are driving the demand for surface acoustic wave devices. Acoustic wave biosensor which uses surface acoustic wave device is used in biochemical and biophysics related information. Moreover, growth in usage of surface acoustic wave devices in the chemical industry is expected to drive the market further. The surface acoustic wave devices are used for taking reading of the pH viscosity of various chemical substances. Furthermore, surface acoustic wave devices are used to check the viscosity and density influence of any kind of chemical. In aerospace and defense sector, surface acoustic wave sensors are used to measure pressure, temperature or strain fluctuations. Lack of scope for technology up gradation, lack of compatibility of SAW devices and region specific demand have negatively affected growth potential of surface acoustic wave devices market. Application of SAW devices in environment monitoring program is identified as future growth opportunity for the market. 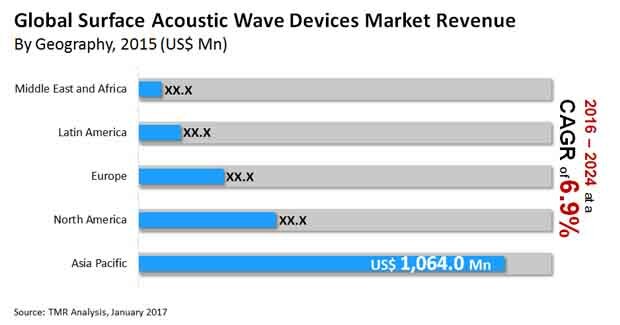 The surface acoustic wave devices market on the basis of devices has been segmented into filters, oscillators, resonators, transducers and others. The surface acoustic wave device on the basis of end use industry has been segmented into aerospace and defense, telecommunication, environmental and industrial, automotive, consumer electronics, healthcare & medical and others. The global surface acoustic wave devices market by geography has been broadly segmented into North America, Europe, Asia Pacific, Middle East and Africa and South America. The market report deals in the forecast of the surface acoustic wave devices market in terms of revenue (USD million) in terms of revenue as well as the CAGR for the forecast period of 2016 to 2024. The competitive profiling of the key players in the global surface acoustic wave devices market has been comprehensively covered under the scope of the report. The key players in the SAW devices market have been competitively profiled across the five broad geographic regions. This competitive landscape is inclusive of the various business strategies adopted by these major players and their recent developments in the field of SAW devices. In order to provide a detailed insight into the market dynamics of global surface acoustic devices market, the drivers and restraints affecting the industry are included in the study. Market dynamics include market opportunity, drivers and restraints and an extensive analysis of these factors are included in the report. Furthermore, market attractiveness breakdown has also been provided in the report. Therefore, the report provides a comprehensive study of the global surface acoustic wave devices market and also offers the forecast of the market for the period from 2016-2024. Some of the key players operating in the surface acoustic wave devices include Taiyo Yuden (Japan), Tai Saw Technology Co. Ltd. (China), Skyworks Solutions (The U.S.), Infineon Technologies AG (Germany), TDK Corporation (Japan), Murata Manufacturing Co. Ltd (Japan), API Technologies (The U.S.), Osilent Corporation (The U.S.), Kyocera Corporation (Japan ) and ITF Co., Ltd. (South Korea) among others. Growth through merger and acquisition is a key strategy adopted by the players. Skyworks Solutions has acquired PMC-Sierra to strengthen its business of data storage. This acquisition has also improved research and development facilities for the company. The company has strong stock of patents across different verticals and also maintains strong product portfolio to customer requirements.